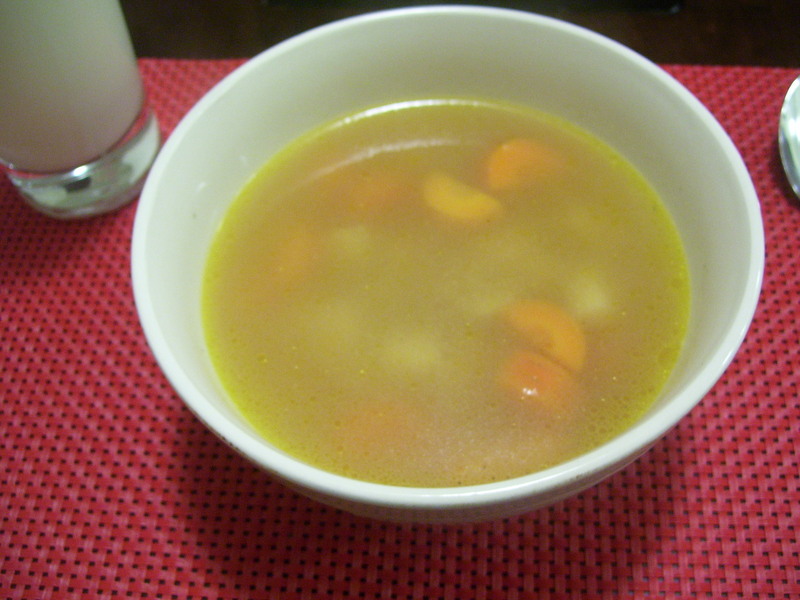 A couple years ago my husband made this soup for the first time. He picked it out of one of Mark Bittman’s books. I think it was How To Cook Everything but I can’t be sure. What I do know is this soup has become a staple in our house. And it’s really tasty. This soup uses 5 ingredients and it comes together in under 30 minutes. For us, it’s a perfect busy weeknight meal. We had it tonight with some warm, crusty bread. I really like broccoli salad. Years ago, I really liked one from a popular salad restaurant chain in California. The downside? SOMETHING in that salad made me sick. Every single time I ate it. Every. Single. Time. Eventually, after a handful of times I figured out it was the broccoli salad and had to give it up. And I’ve sadly avoided it ever since. Heidi over at 101 Cookbooks posted a recipe for broccoli salad. In fact, it’s been there for years but I just recently came across it. And I HAD to try it. For those of you not familiar with Heidi, she awesome. You need to go check out her site. She takes beautiful photos, shares amazing recipes, travels and she has a new cookbook being released in April – I’m so excited to see it!!! I adore her and have loved every recipe of hers I’ve tried. And this one did not disappoint. It is amazing, I just had to share it here! I made a couple changes to the original recipe so if you want to check that one out, click here. To make the fried shallots heat up about a tablespoon of olive oil (or clarified butter) in a large skillet. Cook for about 15 minutes until they’re dark but not burned. Drain on a paper towel. Bring a pot of water to a boil, large enough to accommodate the broccoli. Generously salt water. Drop in broccoli and quickly cook, just long enough to take the raw taste away, no more than 20-30 seconds. Be careful not to overcook it! While broccoli is briefly cooking, fill a bowl with cold water. Drain broccoli and dunk in cold water to stop cooking. Give it a spin in the salad spinner to dry it so it doesn’t make the salad soggy. Make salad dressing in a small bowl by whisking together the garlic paste, almond paste, lemon juice, honey and olive oil. Add the hot water to the dressing and whisk until the dressing gets creamy. Taste dressing and adjust seasoning, if necessary. 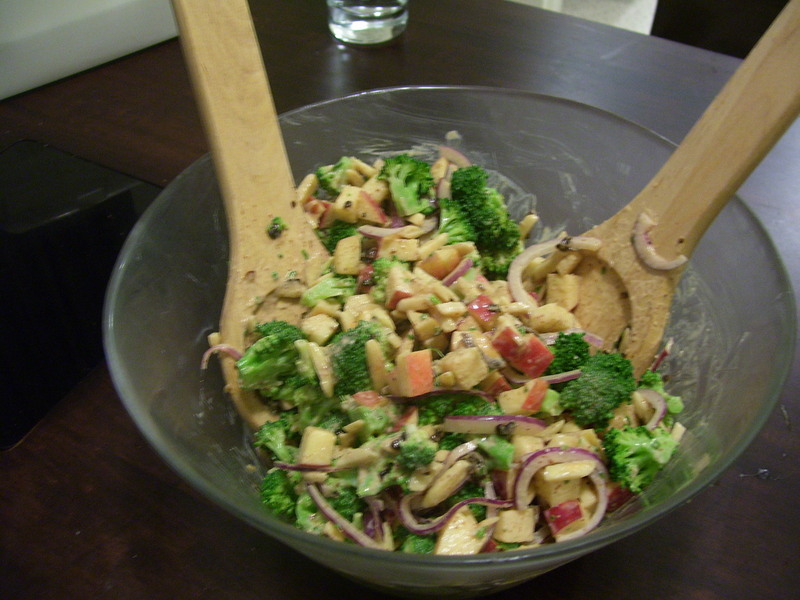 In a salad bowl, combine the broccoli, diced apple, red onion, nuts and the fried shallots with the dressing. Toss well. I made this for dinner last night. It comes together really quickly, especially when I use boneless, skinless chicken thighs. A nice surprise was finding out it has a very low PointsPlus value. 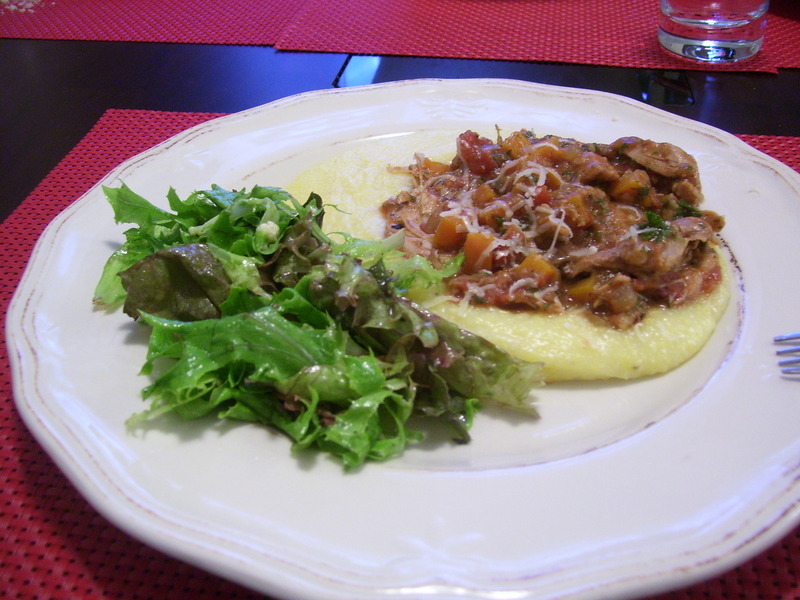 I served it with polenta because I had some in the cupboard but it’s also great with egg noodles. Season chicken liberally with salt and pepper. Lightly dredge both sides of chicken in flour. Heat oil in dutch oven or soup pot until shimmering. Working in batches, brown chicken, about 2-3 minutes per side. Set chicken aside on plate. Add onion and pinch of salt to the pot and cook for 2 minutes, stirring frequently. If the pot gets dry, add a touch of water or olive oil. Add celery, carrot, garlic, thyme and bay leaf. Cook for 5 minutes or until veggies begin to soften. Pour wine into the pot, scraping the bottom to remove all the brown bits. Add tomatoes along with chicken and any accumulated juices and stir well. Bring to a boil, reduce to simmer and cook for 15-20 minutes. Remove chicken and bay leaf from pot. Shred chicken and return to pot. Stir in parsley and taste. Adjust seasoning, if necessary. Bring water, butter and salt to boil in sauce pot. Cook for 25 minutes, stirring fairly often. It will thicken up as it cools. 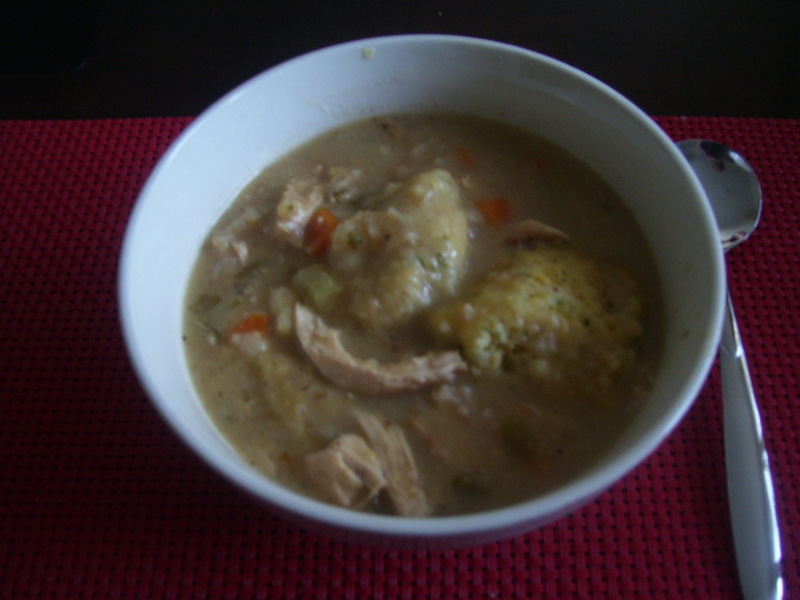 The first time I remember having chicken and dumplings like this, my boyfriend (now husband) made it for me. The weather had been crummy and he offered to make dinner. How could I refuse! He looked through a couple of cookbooks, settled on a recipe and went to the market. He handed me the remote, an ice cold beer and told me to stay out of the kitchen. Over the next three hours I heard pots crashing along with random outbursts and cussing (he was a beginning cook way back then). While it was a little disconcerting, the house smelled so good! Finally he came out of the kitchen, covered in flour and said that dinner was ready. He handed me a big bowl of stew, a fresh beer and took the remote back. Of course. Now, I want to surprise him with chicken and dumplings. He loves it and has been working long hours. Plus, it’s been cold and stormy outside. The recipe he had used is in a cookbook that is currently living in storage at his parents house in the states. When I’m in a pinch and I need to find a recipe I generally start at epicurious.com and hope to find something that doesn’t sound too fussy. I found one recipe that sounded ok but I wanted to surf around to see what else was out there. I’ve heard a lot about The Pioneer Woman lately so I hopped over to her site. And sure enough, she has a recipe. And it has cornmeal dumplings! Nom! I did make a few changes to suit my laziness and the tastes of my family. You can view the original recipe here. Generously season chicken with salt and pepper. Heat oil and butter in soup pot. 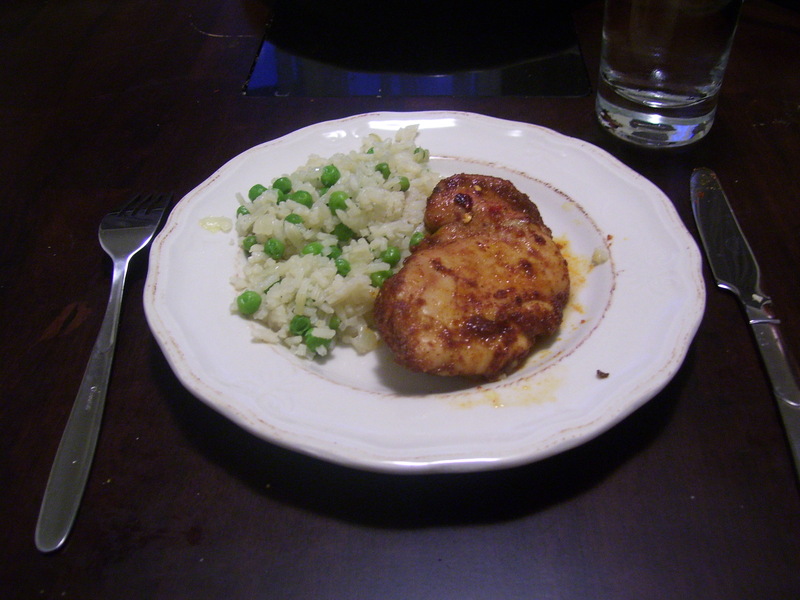 Deeply brown chicken on both sides. I needed to do this in two batches. Set aside. Saute onions, carrots and celery for a few minutes until the begin to soften. Stir in thyme. Add chicken stock, apple juice and return chicken to pot along with any accumulated juices. Stir. While the stew is simmering, make dumplings. In a medium sized bowl, stir together dry dumpling ingredients. Make a well in the center and pour in milk, cream and parsley. Stir just until combined. Set aside. Remove chicken from pot and shred with 2 forks. Or you could leave it whole, I just don’t like dealing with bones in my stew. Add shredded chicken back to pot. Stir. Taste and adjust seasonings. Add salt or pepper, if necessary. 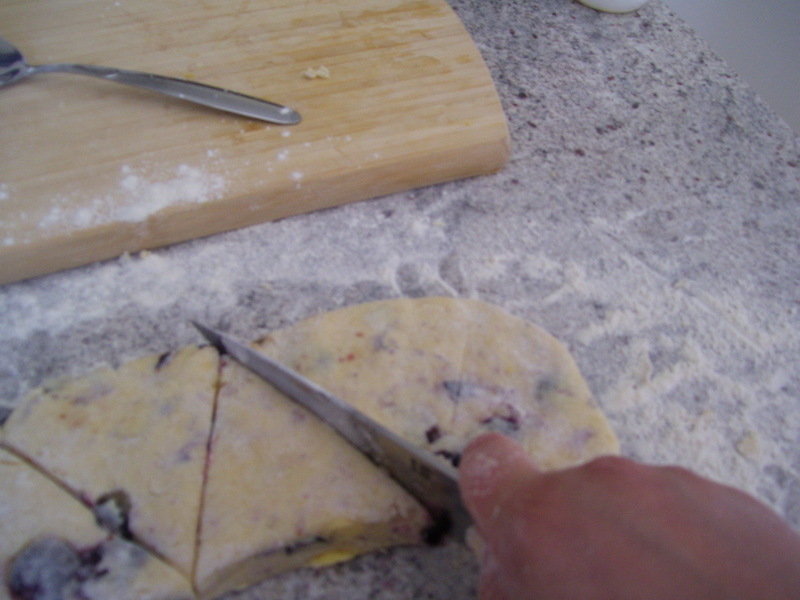 Using 2 spoons, scoop a little dough onto one spoon and scrape off into pot using the other spoon. I made golf ball sized dumplings. Partially cover pot once all dumplings are in soup and cook for 15 minutes. Turn off heat and let sit for 10 minutes. I’m not sure if I’ve mentioned it before but my husband loves chicken. He would happily eat it every single night without complaint. Since I’m not as big of a fan, I need to do a lot of different things with it so I don’t become sick and tired of it. I came across this recipe on Home Ec 101 and I’m SO glad that I did. It was so unbelievably tasty. To see the original recipe, click here. That being said, I think the next time I make it I’m going to do some experimenting and try cooking it in the slow cooker. I have a feeling it will be even better. I’ll post an update in a couple weeks when I do. Yes, it was THAT good. 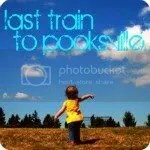 I already want to make it again. I’m pretty sure I would make it again tonight if I had any chicken laying around. I used my own chili powder for this recipe because I can’t find it anywhere in Wellington. If anyone out there wants the recipe for it, let me know and I’ll post it. Looking at this now, I should have wiped off the plate. Heh. 1. Put chicken and next 5 spices, into a bowl and mix well. I used my hands because it seemed easiest. 2. Put on baking sheet lined with foil. Broil 6 minutes then flip over. Broil 6 more minutes. 3. Brush glaze on chicken. Broil 1 minute. 4. Flip over and brush more glaze on chicken. Broil 1 more minute until cooked through. I served this with rice and peas. I chose this side dish because my toddler loves peas. I love how it came together really quickly and it made me question why I ever used to buy instant rice. Melt butter in saucepan that has a tight fitting lid. Add diced onion and saute until softened. Add rice and saute for a couple minutes, until it becomes opaque. Add chicken stock and bring to a boil. Stir it up, cover and reduce the heat to low. After 20 minutes, add peas, stir. Turn off heat. Put the lid back on for at least 2-5 minutes, this will heat the peas and they won’t overcook or get mushy. 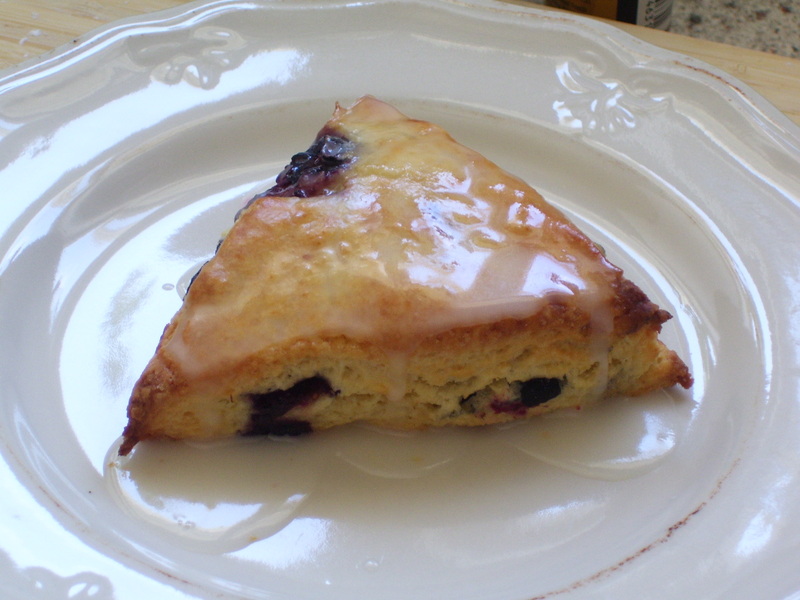 I used to make thousands of scones every week when I worked in the bakery. I loved that quiet yet insanely busy time of the day and daydream about it from time to time when I’m feeling nostalgic. 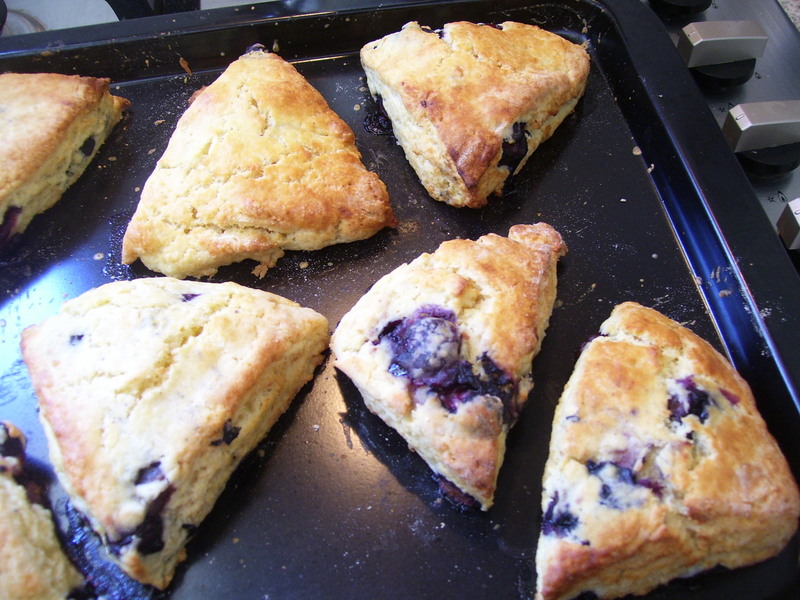 Now that many years have passed, I still find making scones therapeutic. From the way the flour feels in my hands to the way my house smells when they bake. 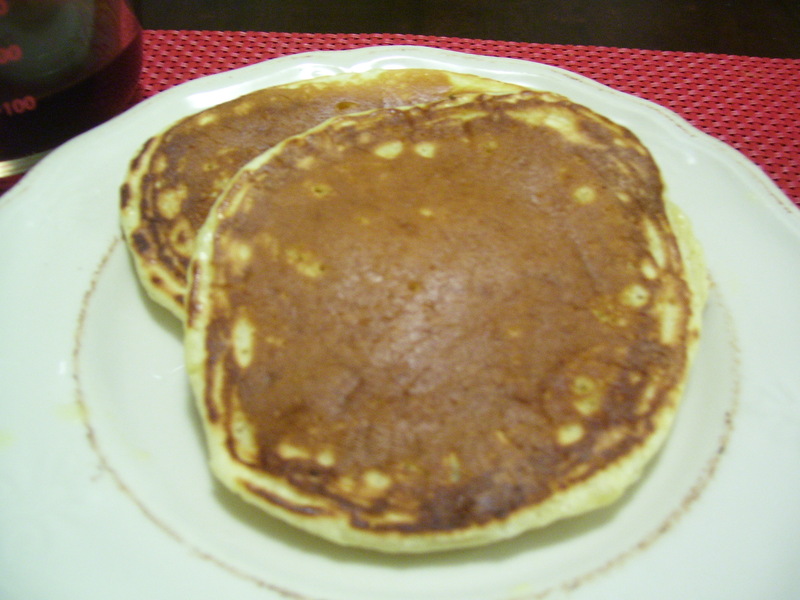 I could make them every week for my family and never get tired of them. One thing I especially like about them is that they don’t require any special equipment. No mixer or muffin tins are required. Another plus is that most of the ingredients are pantry staples for me so all I need to do is buy some berries and I’m ready to get baking. The finished product. Blueberry Lemon Tastiness. In a medium bowl, stir together flour, sugar, baking powder and salt. Add butter and lemon zest. Using a pastry blender, two butter knives or your hands (my preferred method) cut/combine butter into flour mixture until butter is about the size of peas. Add blueberries and give a quick stir. 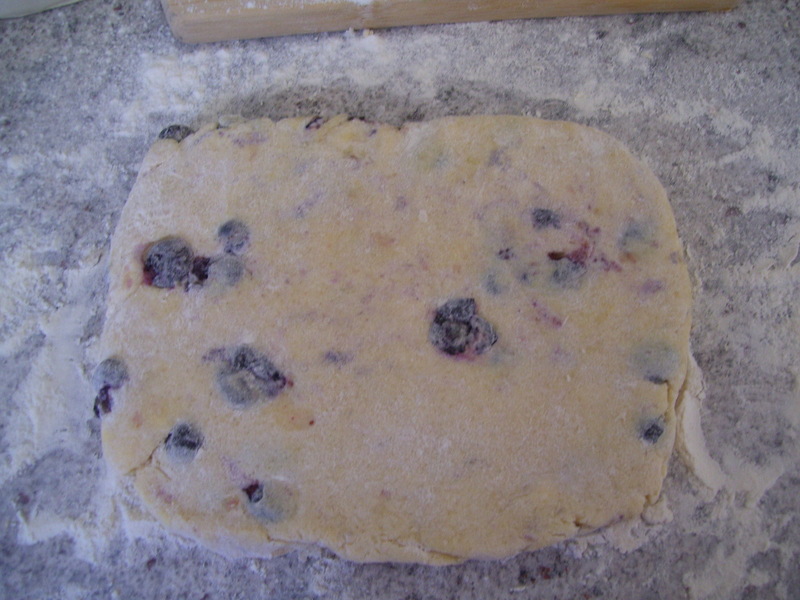 Add cream and mix only until the dough begins to form. As soon as it does, stop. Turn dough out onto floured counter top. Gently knead dough until it comes together, about 10 seconds. 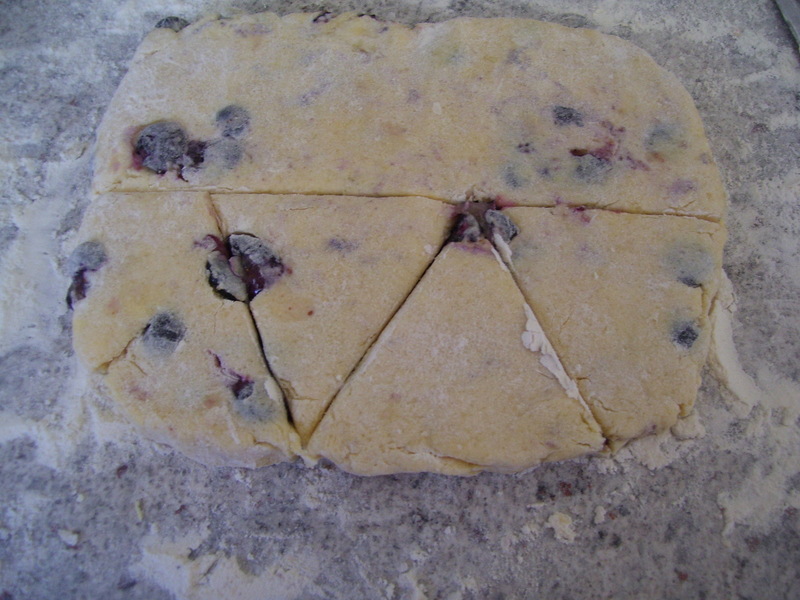 Cut dough in half horizontally. Yeah, I cut these a little large. It made my husband VERY happy. Cut into triangles, however big or small you like them. Make glaze: in a small bowl, stir lemon juice into powdered sugar and stir well.